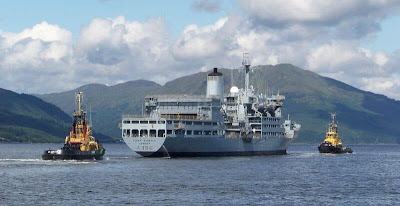 As mentioned previously, the Royal Fleet Auxiliary FORT AUSTIN has spent some time over the past few days conducting exercises with two of the Clyde's Serco-Denholm tugs. What is unusual about the arrangement seen here is that both tugs are bow-on to the ship under tow, rather than both facing the direction of tow, in the conventional manner. At FORT AUSTIN's bow is SD-IMPETUS, with SD-IMPULSE at her stern. FORT AUSTIN has been working with these two tugs in the lower Loch Long area since Monday, returning to anchor at the Tail of the bank each evening. I am grateful to a correspondent for having sent this image to ClydeSights. Is Ark Royal coming back in cause they will need plenty of practice if she is!! "did any one feel a bump?"